A Marine vet set a new Guinness World Record pull-up record with the help of a strange yet highly effective training regimen. How did he do it? Read this article to find out! 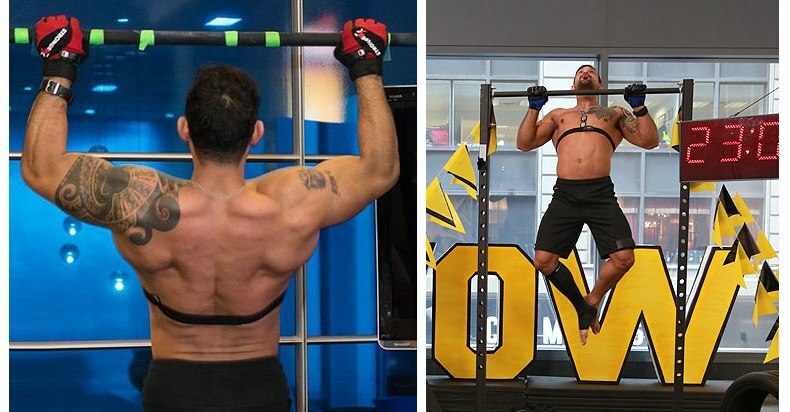 On November 11, 37-year old Marine Corp veteran Guy Valentino completed a staggering 5,862 pull-ups in 24 hours in an attempt to inspire vets to make a commitment to their health and wellness, while hundreds of them from across the New York City region cheered on him and celebrated the official record-breaking. This was no small feat for sure – but for a Marine vet whole pulled through 36-hour raids in Iraq, it was a lot more reachable than for most of us. Still, he couldn’t have done it without employing a smart strategy! If you already believe that the most brilliant things are also the simplest, this will delight you. He did 5 reps every minute. He pretended he was on a mission in Iraq. By performing 5 reps every minute, he was able to keep his heart rate consistently low, which helped him conserve energy for the long haul. On the other hand, by reframing the near-impossible feat as a Marine mission, he could divide it into more manageable smaller goals, so he imagined reaching a checkpoint with every 1,000 pull-ups, where he was able to resupply fellow Marines with food and ammo. Quitting was not an option because the lives of the other Marines depended on him. This way, Valentino was able to get into the right mindset for success by using the fortitude he had developed during his encounters with real life-or-death situations. This is a pretty unusual strategy, but it did work for him, and it certainly offers valuable insights that all of us can implement into our approach toward incredibly challenging life goals, be it breaking world records, sculpting a God-like physique or making our first million. Most difficult goals require unconventional game plans in order to be achieved, so thinking outside the box when designing your strategy can be crucial for improving your chances of success. In other words, it’s really important to find a powerful idea that can supply you with unbreakable resilience and keep you going strong even in the face of great adversity. For Valentino, it was the Marines, and not only the imaginary ones at his checkpoints, but also the real ones at home that are battling PTS, chronic disease and unemployment. When he returned home from Iraq, where his battalion of 600-700 people had lost 16 men to improvised explosive devices, he quickly sunk into depression and stopped taking caring of himself. As he felt useless and unable to fit into his community, his willpower and confidence decreased dramatically and soon enough his health deteriorated and he gained a lot of fat. One day, as he realized that, after a decade of successfully maintaining single-digit body fat, his body had become a mess and he had love handles for the first time in his life, he finally decided it was time to get his life back on track. He was determined to get his physical and mental strength back, so he started working out again. As his body was becoming fitter, he felt the depression that swallowed his courage was gradually fading away while his confidence grew with each passing day. Training changed his life so much that he made a full-time job out of it and eventually opened his CrossFit box in Dallas, called CrossFit Apocalypse. Naturally, he wanted to share his experience with other veterans and help them overcome their difficulties and improve their lives. “I want to get veterans to wake up from PTSD, depression, addiction, and suicidal thoughts,” says Valentino. “I want them to get back to the foundation of what makes military men and women strong, which is physical fitness. In order to send a message of hope to as many vets as possible, as well as educate the public about the challenges vets face upon their return home, he partnered with Spike TV’s Veterans Operation Wellness initiative to film his world record attempt. Valentino broke the record thanks the physical and mental plan he created, but the support he gathered from the veteran community also contributed greatly to his success. Before he began the feat, he surrounded himself with reminders of his mission, such as his Marine Corps flag and a map of Iraq. “It was a reminder to me that no matter what I was facing, I would finish it out,” he says. As he pushed himself closer and closer to his limits, he played the slogan “the few, the proud, the Marines” over and over again in his head, to remind himself of his courage and resilience. Motivated to prove to himself and to every other vet out there that there isn’t a difficulty that a Marine can’t overcome in order to finish his fight all the way, Valentino kept going despite all the pain and exhaustion and ignored the fact that every cell in his body was begging him to stop. “It’s impossible to quit when your mission is so much bigger than you”, he says. And we couldn’t agree more. If you think big, work consistently, and refuse to accept failure as an option, both your body and your mind will be primed for achieving top results.